I received this earlier today. The Places Between: The Best of Doves is set for release on Astralwerks/Heavenly Recordings on Tuesday, April 6. 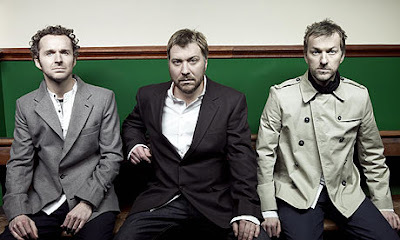 So here we are, 12 years since Doves formed in Manchester and released the Cedar Room EP on the Casino Records imprint, and 10 years since Doves epochal debut, Lost Souls was released on Astralwerks/Heavenly Recordings. In that time we have been privy to a catalogue of genre-warping singles and a quartet of albums that have forced writers to go back to the thesaurus in search of new superlatives. These are The Places Between, a multi-format Best Of that has cherry picked the best from UK number one albums: The Last Broadcast and Some Cities, last year's critically acclaimed masterpiece, Kingdom Of Rust and their generation defining debut Lost Souls. Indeed, from UK number 3 hit "There Goes The Fear" to the Motown thump of "Black and White Town" and the anthemic morning-after glow of "The Cedar Room." The Places Between has been painstaking sequenced by Jimi, Andy and Jez themselves in the way they want you to experience their last decades work, in short this is the definitive Doves Best Of. Furthermore, in addition to a host of B sides, rarities, and unreleased tracks that make up the second disc there is asmattering of brand-new recordings, "Blue Water," "Drifter" (featuring Cherry Ghost's Simon Aldred) and the brilliant new single "Andalucia." For more information, visit http://www.doves.net/ or www.myspace.com/dovesmyspace. Pat DiNizio, seen here on the right, as seen through my camera lens on Thursday night, Feb. 18 at an outstanding show at The Coach House. As concert-going treks go, I have two wonderful ones to report since I last checked in. On Thursday night, Feb. 18, I caught Smithereens singer-songwriter Pat DiNizio in a wonderful performance at The Coach House in San Juan Capistrano. Let me begin with my most recent show. Although I have caught the Steve Miller Band in concert a few times since the mid-1990s, I have to say that the classic rock troupe's show at the Honda Center in Anaheim on Saturday night, Feb. 20, was definitely my favorite of the times I have seen singer-songwriter-guitarist Steve Miller & company. The headliner at Cal State Fullerton's Front & Center 2010 fundraising event, the Steve Miller Band was featured in a role to help support education and university scholarships. Miller was more chatty than he has been in the past and talked at length about the importance of education and music in the lives of children and children of all ages throughout his 110-minute set. Indeed, when he closed the concert with a rousing version of "Jet Airliner," he brought up more than a dozen of the university students who had performed a "Glee"-styled song and dance show earlier in the night to sing with him. During the night, Miller also noted that he was donating $25,000 of his own money to Saturday night's cause. The show itself boasted most of his best-known hits ("Fly Like an Eagle," "Rock'n Me," "Jungle Love," "Take the Money and Run"), but Miller - always a proponent of the blues - offered up so deeper moments courtesy of several Jimmie Vaughn covers (including "Sweet Soul Vibe") and a tribute to Bo Diddley with a version of the late rocker's "Pretty Thing" where Miller used a Gibson Flying V to help get the reverb sound used by Diddley. And for those who love "The Joker," Miller offered up the song once as an acoustic number and later on in the night with the whole band. Nice. The most heartfelt tribute came to longtime Steve Miller Band member Norton Buffalo, a great harmonica player who died of cancer in October 2009. Miller noted that he still can't believe Norton is gone before playing a solo acoustic version of the wonderful "Wild Mountain Honey." Miller's vocals and guitar playing were wonderful throughout the night, and accolades to his entire band (Joseph Wooten on keyboards and backing vocals, drummer Gordy Knudtson, bassist-sometimes guitarist Kenny Lee Lewis and fantastic lead-backing vocalist Sonny Charles). Rock fans wanting to celebrate the 30th birthday of one of rock 'n' roll's most enduring -- if unsung -- bands were in the right place if they were at the Coach House on Thursday night. The Smithereens technically weren't on the bill, but that band's principal songwriter and lead singer Pat DiNizio had returned to the San Juan Capistrano venue. And while the show was billed as a solo acoustic appearance from the New Jersey rocker, fans got the best of both worlds. First came an hour-long set of songs to the accompaniment of his acoustic guitar. Then DiNizio brought up Smithereens bassist Severo "The Thrilla" Jornacion, Orange County-based singer-songwriter-guitarist Kenny Howes and legendary drummer Rafael Gayol (formerly with BoDeans and currently Leonard Cohen's touring timekeeper) to back him for a full-blown 70-minute electric set of Smithereens classics, plus material from DiNizio's recent self-titled effort and wonderful covers of classics from Buddy Holly, the Beatles, the Monkees, even Black Sabbath. The long night proved to be a casual affair, with DiNizio offering up funny and detailed insights into how many of his songs were written before performing them. For example, he revealed that while the Smithereens' 1986 breakout Especially for You had been written over the course of five years dating back to the band's formation at the dawn of the 1980s, the equally strong follow-up from 1988, Green Thoughts, was written in a mere five weeks. The Smithereens remain one of the hardest-rocking bands to emerge from the power-pop scene, yet DiNizio's songs are generally so tuneful and well-crafted, they work just as well when delivered as folk numbers. He noted in the first half of his show that when artists run out of ideas, they often put themselves in a mode of writing as if they were someone else. That was his approach in writing "Especially for You," for which he admittedly immersed himself in the style of composer Burt Bacharach and lyricist Hal David. His performance of that song was among his acoustic-set highlights, as was the decidedly more original "She's Got a Way," an uptempo rocker from the Smithereens' 1999 disc God Save the Smithereens that proved to be a touching song about his young daughter. One of the best cuts off Pat DiNizio is the intoxicating "Any Other Way," a track that recaptures the theme of so much of DiNizio's style. Indeed, many of his best songs ("Behind the Wall of Sleep," "Blood and Roses," "Drown in My Own Tears," "Room Without a View") perfectly capture romantic despair, the music built out of dark, heavy, haunting riffs positioned around big, cruncy, instantly-memorable choruses. And yet there was a celebratory spirit to this show, as DiNizio, a guy known to tour fans' living rooms coast-to-coast, joked with admirers seated at tables near the stage, often thanking them for their support of him and his band (this show marked the first time this lineup of four musicians had shared the stage together; impressive). The rock set was particularly fun, with DiNizio leading the musicians through a breathtaking version of Buddy Holly's "Well Alright." He also paid tribute to the Beatles with a singalong of "You've Got to Hide Your Love Away" and a slow, introspective version of Lennon's masterpiece "Norwegian Wood (This Bird Has Flown)," featuring Howes' delightful textures on Rickenbacker guitar. The whole thing came to a close with a hearty version of "Blood and Roses," the band tearing the roof off just as the Smithereens have in countless appearances here, dating back to the '80s. The night's two openers offered up well-received sets, with the New Wave-tinged pop-rock of Huntington Beach's the Victors decidedly stronger than the reggae-meets-jam-rock of Hair of the Dog. For those who want to catch the Victors perform "Rocket High" and other infectious original songs, the quartet will perform a free show from 7-10 p.m. on Feb. 27 at the Gian Wheel Court at the Irvine Spectrum, 71 Fortune Dr., Irvine. I was sad to come back from a weekend vacation to hear that The Knack's Doug Fieger had passed away after a long battle with cancer. I met Doug in the mid-1990s while we were both checking out a show at The Coach House in San Juan Capistrano. I also had the fortune to finally catch the band in concert on Dec. 31, 2006 at the Orange County New Year’s Eve - better known as OCNYE - at the Orange County Fairgrounds in Costa Mesa. Indeed, those only catching the action on the main stage missed the best performances of the seven-hour event. Although Tommy Tutone (in a mostly acoustic showcase, with the “867-5309/Jenny” singer-guitarist accompanied only by a drummer) disappointed in the first 10 minutes of his set, a short walk to a nearby stage rewarded with an amazing full-blown performance by the Knack. 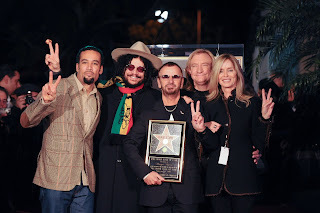 Ringo Starr, center, is seen with (left to right) Ben Harper, Don Was and Joe Walsh, and Starr's wife Barbara Bach, after he received the 2,401st star on the Hollywood Walk of Fame in Los Angeles on Monday, Feb. 8, 2010. The event, watched by thousands of fans, took place in front of Capitol Records at 1750 Vine in Hollywood, where Ringo's star - the 2401st on the walk - was placed in line with fellow Beatles George Harrison and John Lennon, as well as dear friend Roy Orbison. In fact, Roy Orbison's star was celebrated just last week. The Hollywood Chamber of Commerce commemorated the 50th Anniversary of the Hollywood Walk of Fame with a special evening event, and it was full-on Hollywood style celebration, closing off Hollywood and Vine and using search lights to emblazon the night sky. Ringo applauded the change, encouraging the Chamber to continue these in the evening, "I don't know how it is where you come from," he said, "but where I live, the stars come out at night." Leron Gubler, CEO of the Hollywood Chamber of Commerce, welcomed everyone. On hand to induct Ringo was fellow "mocker" and now brother-in-law Joe Walsh, as well as Don Was and Ben Harper. On hand were Ringo's wife Barbara Bach Starkey, Barbara Orbison and son Roy Jr., Olivia Harrison, David Lynch, Benmont Tench, Jeff Lynne, Gary Wright and others. Ringo Starr and the All Starrs will tour throughout June, July and early August of 2010. They conclude their tour with a concert at The Greek Theatre in Los Angeles on Aug. 7, 2010. For more information, visit http://www.ringostarr.com/.